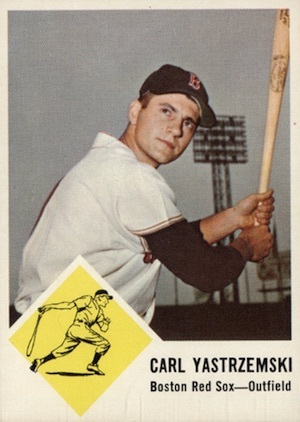 The final attempt by Fleer to carve out a spot in the baseball card market, 1963 Fleer Baseball abandoned the Baseball Greats formula of retired players and went all-in with a new set. Featuring two short prints and several Hall of Fame cards, the key 1963 Fleer option is the rookie card for Maury Wills. After trying for four years to get into the gum card market without directly competing with Topps, Fleer finally threw down the gauntlet. 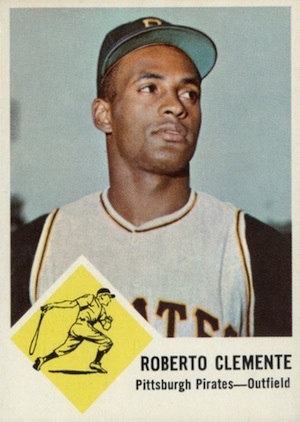 Featuring current baseball players, 1963 Fleer Baseball was a bold move by the company. 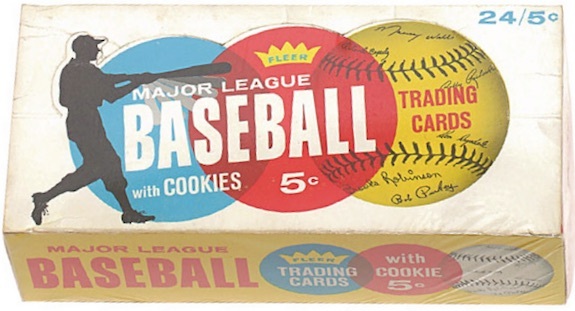 In a strategy designed to circumvent Topps' claim of exclusivity with gum and confectionary products, Fleer packs included a cherry-flavored cookie. 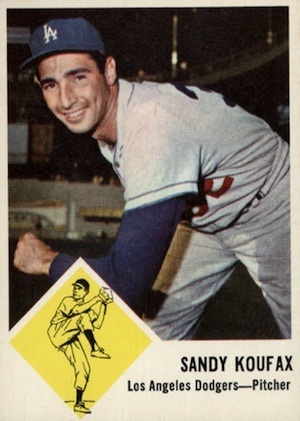 Shop for 1963 Fleer Baseball cards on eBay. Predictably, Topps took Fleer to court. They won the case and Fleer was forced to stop their set before a second series could be issued. Fleer was officially out of the baseball card business, but they still released products related to baseball over the years, including team stickers, patches, and cards featuring retired legends. Most importantly, they kept challenging Topps' monopoly until 1980, when they were finally allowed to directly compete with them. Covering players from each of the 20 MLB teams, 1963 Fleer Baseball fronts feature a large player photo. Below that is a yellow diamond showcasing an assortment of player drawings. The player's name, team and position is noted at the bottom of the card. In a way, it's not too far off from the design Topps used for its own '63 set, with a second picture in place of the diamond. However, the 1963 Fleer Baseball backs went a different direction. Utilizing a vertical format, the backs feature an extensive write-up with stats at the bottom. The card number appears right in the middle, inside a graphic of a baseball and two bats. The entire back includes a bright green border with the same color used for the player's name at the top. 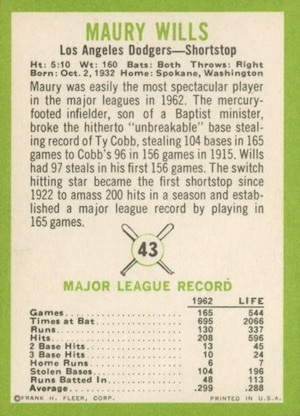 While the Cooperstown residents get a lot of attention from the hobby, the most important addition to the set is Maury Wills, who wasn't included in 1963 Topps. This was reportedly because Wills had been snubbed by Topps while in the minor leagues, which pushed him to sign with Fleer. 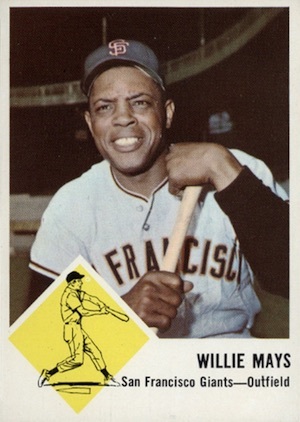 Wills was the National League MVP in 1962 after setting the modern stolen base record at 104. His '63 Fleer card front notes his MVP award instead of the player drawing found on the rest of the cards. 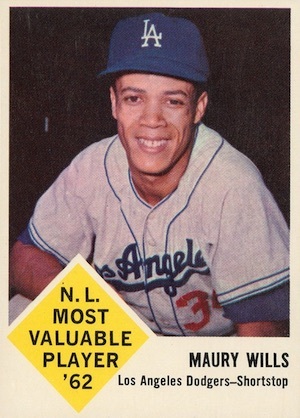 Maury Wills is the only rookie card in the set. Although the HOF cards are some of the most valuable 1963 Fleer Baseball cards, two short prints are generally the toughest to find. 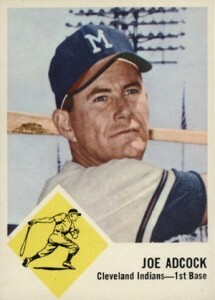 This includes the unnumbered checklist and Joe Adcock (#46). Because of the nature of the set size and the fact the product was printed in 132-card sheets, the 66-card card set worked perfectly. However, in order to add a checklist to the set, Adcock was removed from some of the printings. As a result, both cards are considered to be SPs. However, because of their intended usage, the checklist cards are much tougher to find in high grade. 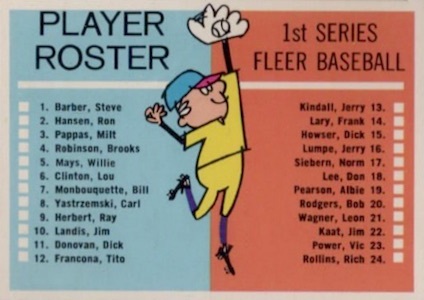 Despite being a small release and missing some of the biggest names of the day, there are still a decent amount of stars included in 1963 Fleer Baseball. The 11 Hall of Fame members in the checklist offer good quality in a manageable set size, further enhancing the collecting appeal of the product. Availability, centering problems and the green borders generally cause the most problems for high-grade collectors. 1963 Fleer Baseball #4 Baltimore Orioles Brooks Robinson card. 1963 Fleer Warren Spahn – #45 SGC 86! NM+ Braves! 1963 Fleer Rich Rollins – #24 SGC 92! NMMT+ Twins! 67 cards. Shop for base sets on eBay. 1963 FLEER #61 BOB GIBSON CARDINALS HOF EX-MT+ PSA 6.5?